Download "NOTICE OF APPROVED SETTLEMENTS IN ZUNGUI HAIXI CORPORATION SECURITIES CLASS ACTION READ THIS NOTICE CAREFULLY AS IT MAY AFFECT YOUR RIGHTS"
1 NOTICE OF APPROVED SETTLEMENTS IN ZUNGUI HAIXI CORPORATION SECURITIES CLASS ACTION READ THIS NOTICE CAREFULLY AS IT MAY AFFECT YOUR RIGHTS Who this Notice is For: This notice is directed to everyone that acquired shares of Zungui Haixi Corporation ( Zungui ), during the period from August 11, 2009 through to and including August 22, Court Approval of Three Settlements in the Class Action On October 3, 2011, Jerzy Zaniewicz and Edward Clarke ( Plaintiffs ) commenced an action in the Ontario Superior Court of Justice ( Court ) against Zungui Haixi Corporation ( Zungui ), Ernst and Young LLP, Zungui s former directors, certain of Zungui s former executive officers as well as the underwriting syndicate for Zungui s initial public offering on the Toronto Stock Exchange. The Plaintiffs alleged that Zungui s initial public offering prospectus and some of Zungui s other disclosures were materially false and/or misleading ( Action ). The Court has approved three settlements, which conclude the Action. The Settlements are compromises of disputed claims and are not admissions of liability, wrongdoing or fault on the part of any of the Settling Defendants, all of whom have denied, and continue to deny, the allegations made against them. 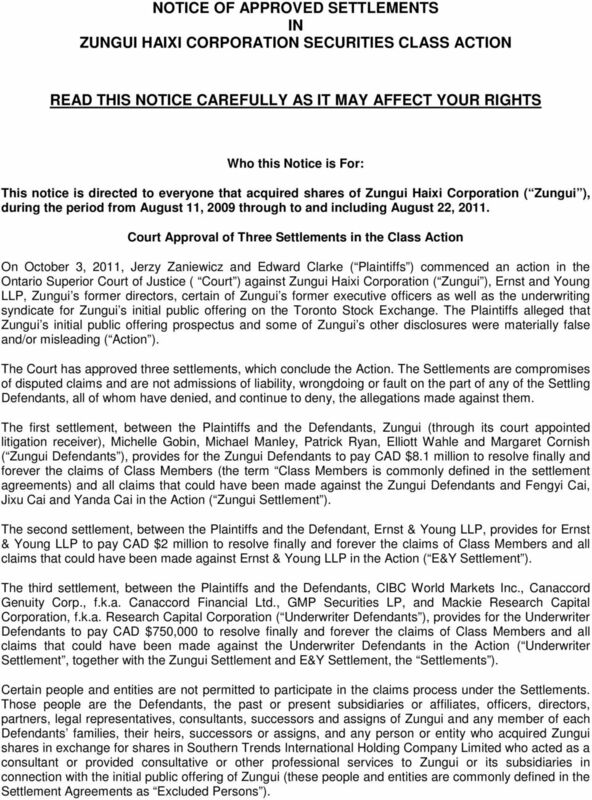 The first settlement, between the Plaintiffs and the Defendants, Zungui (through its court appointed litigation receiver), Michelle Gobin, Michael Manley, Patrick Ryan, Elliott Wahle and Margaret Cornish ( Zungui Defendants ), provides for the Zungui Defendants to pay CAD $8.1 million to resolve finally and forever the claims of Class Members (the term Class Members is commonly defined in the settlement agreements) and all claims that could have been made against the Zungui Defendants and Fengyi Cai, Jixu Cai and Yanda Cai in the Action ( Zungui Settlement ). 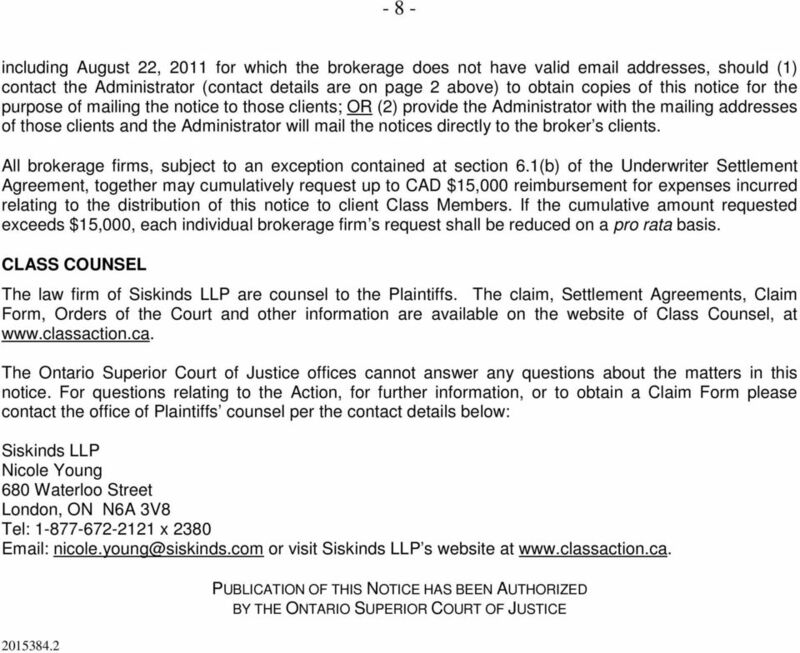 The second settlement, between the Plaintiffs and the Defendant, Ernst & Young LLP, provides for Ernst & Young LLP to pay CAD $2 million to resolve finally and forever the claims of Class Members and all claims that could have been made against Ernst & Young LLP in the Action ( E&Y Settlement ). 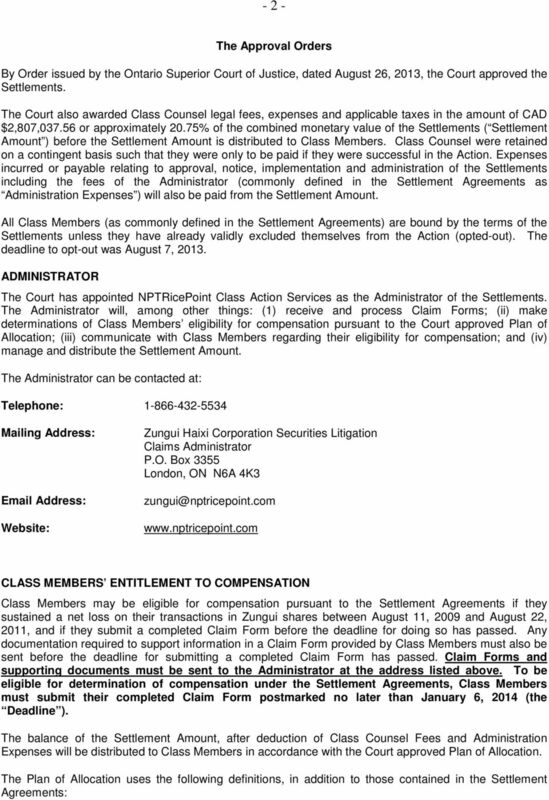 The third settlement, between the Plaintiffs and the Defendants, CIBC World Markets Inc., Canaccord Genuity Corp., f.k.a. Canaccord Financial Ltd., GMP Securities LP, and Mackie Research Capital Corporation, f.k.a. Research Capital Corporation ( Underwriter Defendants ), provides for the Underwriter Defendants to pay CAD $750,000 to resolve finally and forever the claims of Class Members and all claims that could have been made against the Underwriter Defendants in the Action ( Underwriter Settlement, together with the Zungui Settlement and E&Y Settlement, the Settlements ). Certain people and entities are not permitted to participate in the claims process under the Settlements. Those people are the Defendants, the past or present subsidiaries or affiliates, officers, directors, partners, legal representatives, consultants, successors and assigns of Zungui and any member of each Defendants families, their heirs, successors or assigns, and any person or entity who acquired Zungui shares in exchange for shares in Southern Trends International Holding Company Limited who acted as a consultant or provided consultative or other professional services to Zungui or its subsidiaries in connection with the initial public offering of Zungui (these people and entities are commonly defined in the Settlement Agreements as Excluded Persons ). 3 - 3 - (a) (b) (c) (d) (e) (f) (g) (h) (i) (j) (k) (l) (m) Acquisition Expense means the total monies paid by the Claimant (including brokerage commissions) to acquire Eligible Shares; Allocation Pool means the sum of the Settlement Amounts paid under the Settlement Agreements dated February 13, 2013 and April 26, 2013 after payment of Administration Expenses and Class Counsel Fees. For greater certainty, Allocation Pool includes the after tax amount of any accrued interest income on the Settlement Amounts; Claimant means a Class Member who submits a properly completed Claim Form and all required supporting documentation to the Administrator, on or before the Claims Bar Deadline; Discounted Nominal Entitlement means a Claimant s Nominal Entitlement less the discount provided for herein, and which forms the second step upon which each Claimant s pro rata share of the Allocation Pool is determined; Disposition Proceeds means the total proceeds paid to the Claimant (without deducting any commissions paid in respect of the dispositions) in consideration for the sale of all of the Claimant s Eligible Shares; FIFO means the principle of first-in, first-out, wherein shares are deemed to be sold in the same order that they were purchased (i.e. 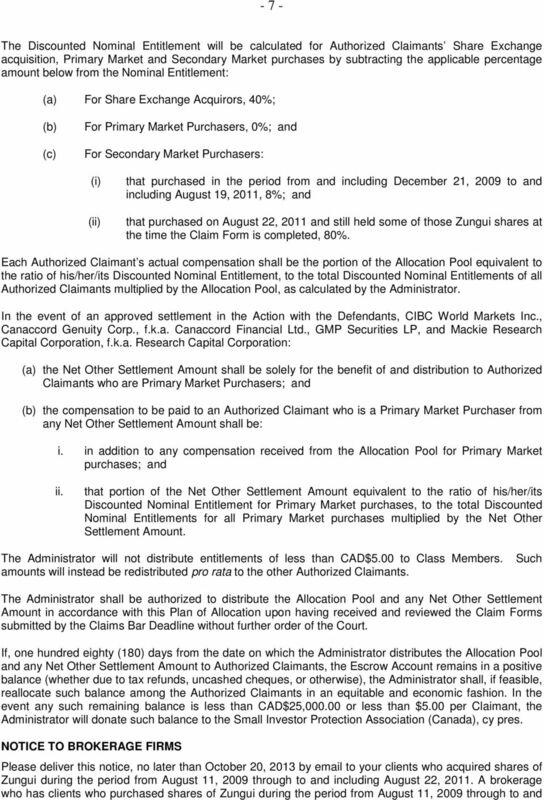 the first shares purchased are deemed to be the first sold); Net Loss means that the Claimant s Disposition Proceeds are less than the Claimant s Acquisition Expense; Net Other Settlement Amount means the settlement amount of the approved settlement in the Action with the Defendants, CIBC World Markets Inc., Canaccord Genuity Corp., f.k.a. Canaccord Financial Ltd., GMP Securities LP, and Mackie Research Capital Corporation, f.k.a. Research Capital Corporation, after payment of Administration Expenses and Class Counsel Fees. For greater certainty, Net Other Settlement Amount includes the after tax amount of any accrued interest income on the settlement amount; Nominal Entitlement means a Claimant s nominal damages as calculated pursuant to the formula set forth herein, and which forms the first step upon which each Claimant s pro rata share of the Allocation Pool is determined; Primary Market Purchasers means Claimants who bought Eligible Shares on an if, as and when issued basis under Zungui s initial public offering pursuant the Zungui IPO Prospectus dated December 11, 2009; Secondary Market Purchasers means Claimants who bought Eligible Shares on a stock exchange (e.g. the Toronto Stock Exchange) or alternative trading system (e.g. 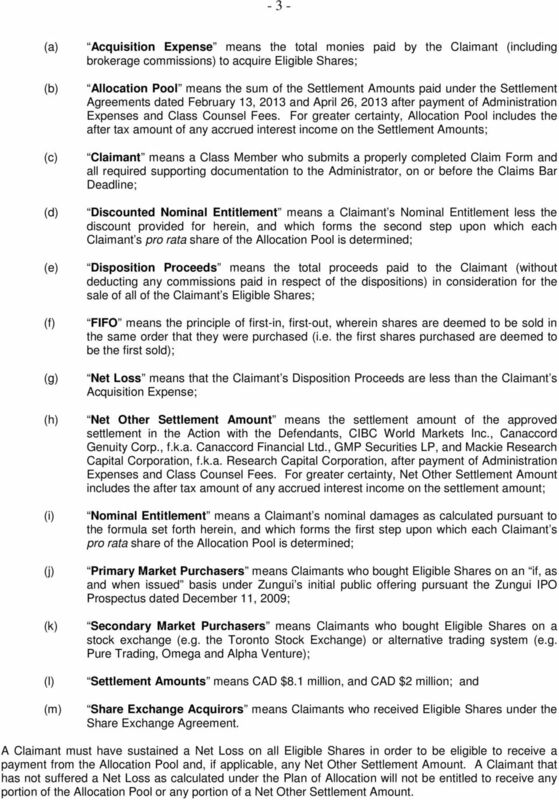 Pure Trading, Omega and Alpha Venture); Settlement Amounts means CAD $8.1 million, and CAD $2 million; and Share Exchange Acquirors means Claimants who received Eligible Shares under the Share Exchange Agreement. A Claimant must have sustained a Net Loss on all Eligible Shares in order to be eligible to receive a payment from the Allocation Pool and, if applicable, any Net Other Settlement Amount. A Claimant that has not suffered a Net Loss as calculated under the Plan of Allocation will not be entitled to receive any portion of the Allocation Pool or any portion of a Net Other Settlement Amount. 4 - 4 - First, the Administrator will determine whether a Claimant has sustained a Net Loss on all Eligible Shares. If the Claimant has sustained a Net Loss, the Claimant becomes an Authorized Claimant, and the Administrator will proceed to calculate the Authorized Claimant s Nominal Entitlement. The date of an acquisition, sale or deemed disposition shall be the trade date of the transaction, as opposed to the settlement date, except for an acquisition of Eligible Shares under the Share Exchange Agreement in which case it shall be the date of acquisition recorded in Zungui s securities register or branch register as may be the case. For the purposes of any calculation relating to Eligible Shares acquired under the Share Exchange Agreement, the Administrator will account for such shares on a post-exchange cost of acquisition basis. Second, the Administrator will calculate an Authorized Claimant s Nominal Entitlement according to the formulae listed below. 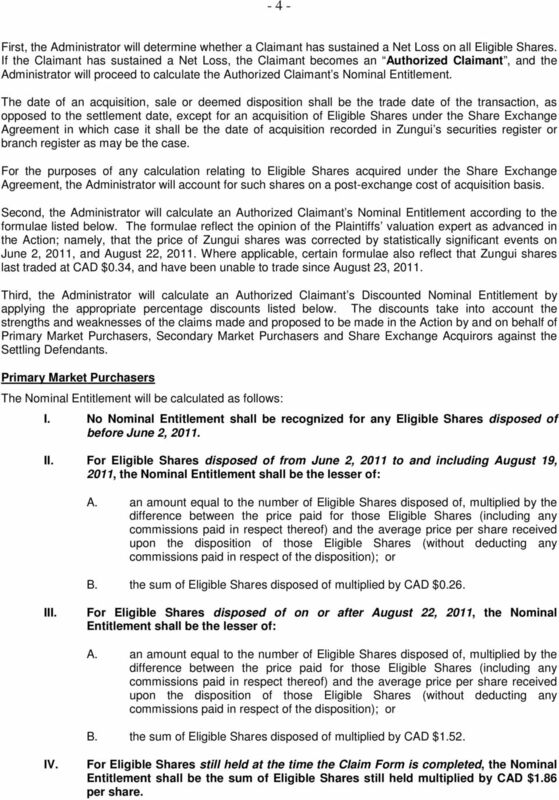 The formulae reflect the opinion of the Plaintiffs valuation expert as advanced in the Action; namely, that the price of Zungui shares was corrected by statistically significant events on June 2, 2011, and August 22, Where applicable, certain formulae also reflect that Zungui shares last traded at CAD $0.34, and have been unable to trade since August 23, Third, the Administrator will calculate an Authorized Claimant s Discounted Nominal Entitlement by applying the appropriate percentage discounts listed below. The discounts take into account the strengths and weaknesses of the claims made and proposed to be made in the Action by and on behalf of Primary Market Purchasers, Secondary Market Purchasers and Share Exchange Acquirors against the Settling Defendants. Primary Market Purchasers The Nominal Entitlement will be calculated as follows: I. No Nominal Entitlement shall be recognized for any Eligible Shares disposed of before June 2, II. For Eligible Shares disposed of from June 2, 2011 to and including August 19, 2011, the Nominal Entitlement shall be the lesser of: difference between the price paid for those Eligible Shares (including any commissions paid in respect thereof) and the average price per share received upon the disposition of those Eligible Shares (without deducting any commissions paid in respect of the disposition); or B. the sum of Eligible Shares disposed of multiplied by CAD $0.26. III. For Eligible Shares disposed of on or after August 22, 2011, the Nominal Entitlement shall be the lesser of: difference between the price paid for those Eligible Shares (including any commissions paid in respect thereof) and the average price per share received upon the disposition of those Eligible Shares (without deducting any commissions paid in respect of the disposition); or B. the sum of Eligible Shares disposed of multiplied by CAD $1.52. IV. For Eligible Shares still held at the time the Claim Form is completed, the Nominal Entitlement shall be the sum of Eligible Shares still held multiplied by CAD $1.86 per share. 6 - 6 - B. the sum of Eligible Shares still held multiplied by CAD $1.86 per share. VII. 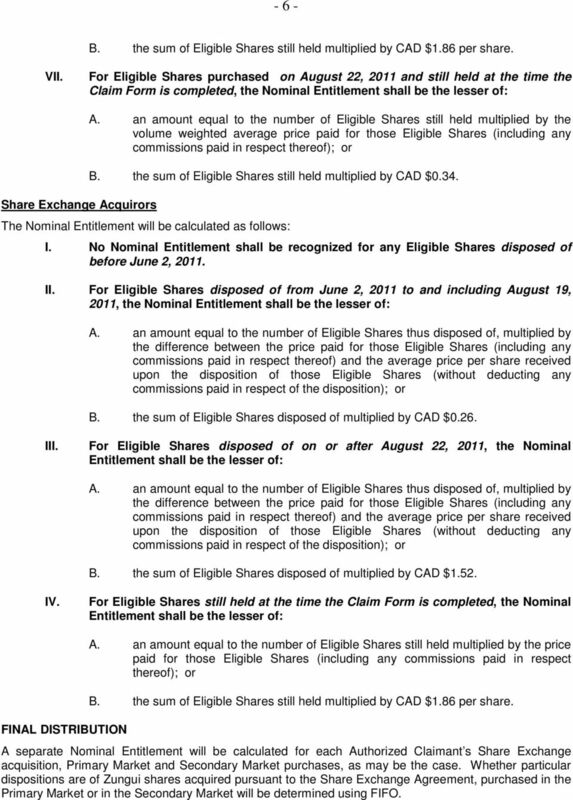 For Eligible Shares purchased on August 22, 2011 and still held at the time the Claim Form is completed, the Nominal Entitlement shall be the lesser of: Share Exchange Acquirors A. an amount equal to the number of Eligible Shares still held multiplied by the volume weighted average price paid for those Eligible Shares (including any commissions paid in respect thereof); or B. the sum of Eligible Shares still held multiplied by CAD $0.34. The Nominal Entitlement will be calculated as follows: I. No Nominal Entitlement shall be recognized for any Eligible Shares disposed of before June 2, II. For Eligible Shares disposed of from June 2, 2011 to and including August 19, 2011, the Nominal Entitlement shall be the lesser of: A. an amount equal to the number of Eligible Shares thus disposed of, multiplied by the difference between the price paid for those Eligible Shares (including any commissions paid in respect thereof) and the average price per share received upon the disposition of those Eligible Shares (without deducting any commissions paid in respect of the disposition); or B. the sum of Eligible Shares disposed of multiplied by CAD $0.26. III. For Eligible Shares disposed of on or after August 22, 2011, the Nominal Entitlement shall be the lesser of: A. an amount equal to the number of Eligible Shares thus disposed of, multiplied by the difference between the price paid for those Eligible Shares (including any commissions paid in respect thereof) and the average price per share received upon the disposition of those Eligible Shares (without deducting any commissions paid in respect of the disposition); or B. the sum of Eligible Shares disposed of multiplied by CAD $1.52. IV. 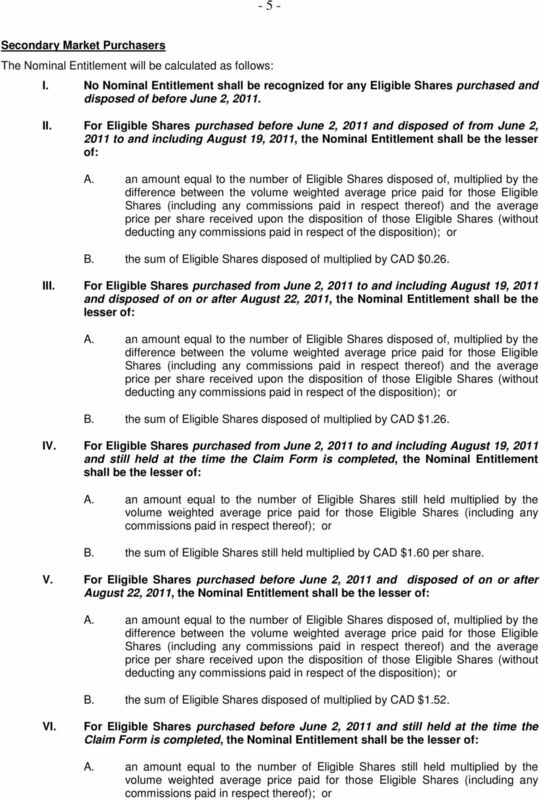 For Eligible Shares still held at the time the Claim Form is completed, the Nominal Entitlement shall be the lesser of: FINAL DISTRIBUTION A. an amount equal to the number of Eligible Shares still held multiplied by the price paid for those Eligible Shares (including any commissions paid in respect thereof); or B. the sum of Eligible Shares still held multiplied by CAD $1.86 per share. A separate Nominal Entitlement will be calculated for each Authorized Claimant s Share Exchange acquisition, Primary Market and Secondary Market purchases, as may be the case. Whether particular dispositions are of Zungui shares acquired pursuant to the Share Exchange Agreement, purchased in the Primary Market or in the Secondary Market will be determined using FIFO. Reasons for Settlement: Avoids the costs and risks associated with continued litigation, including the danger of no recovery. A U.S. Federal Court authorized this Notice. This is not a solicitation from a lawyer. TO UNITED STATES DISTRICT COURT NORTHERN DISTRICT OF GEORGIA ATLANTA DIVISION x In re IMMUCOR, INC. SECURITIES LITIGATION This Document Relates To Civil Action No. 105-cv-02276-WSD CLASS ACTION ALL ACTIONS. SETTLEMENT AGREEMENT Made as of the 5th day of February, 2015 Between Nunzio Cardillo and John Witiluk, individually and in their capacity as the proposed representative plaintiffs in Cardillo et al. v.
UNITED STATES DISTRICT COURT CENTRAL DISTRICT OF CALIFORNIA RANDY ROMERO; ET AL., Plaintiff, v. GROWLIFE, INC.; ET AL, Master File No. CV14 3015 CAS(JEMx) CLASS ACTION Hon. Christina A. Snyder Defendants. PROOF OF CLAIM AND RELEASE YOU MUST COMPLETE THIS CLAIM FORM AND SUBMIT IT BY NOVEMBER 23, 2013 TO BE ELIGIBLE TO SHARE IN THE SETTLEMENT. You may ask to speak in Court about the fairness of the Settlement.